There were a number of pictures worthy of being deemed this week’s big selection — I had a particularly hard time denying this ridiculous picture of NAC Breda players celebrating a rare win in the pitch-side fan jacuzzi. But only one was truly deserving, and it’s due mainly to the circumstances that surround and explain the fuzzy picture snapped by a fan at a Merseyside Costco. You see, that’s a picture of Liverpool’s Uruguayan superstar striker Luis Suárez making a run to his local warehouse club to stock up on booze for the post-signing-a-new-contract party he was about to throw. For a guy who just put pen to paper on a new 5-year, £200,000 a week deal, you might expect for Luis to splurge on something a bit better than Corona. Was it on sale? Do Uruguayan’s love Corona, or is it just the best that could be had on short notice? And furthermore, Suárez buys his own groceries? 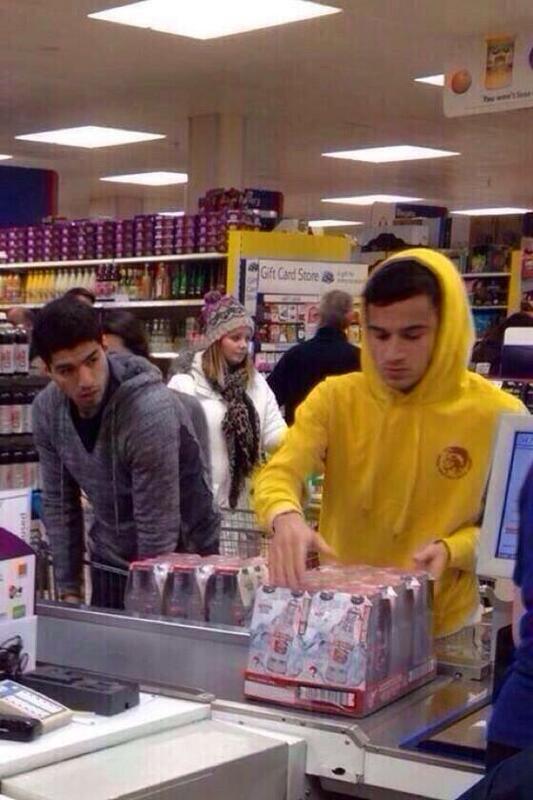 Whatever the case, Luis’ selection was still far better than tag-along Coutinho’s choice of Smirnoff Ice… shakes head disappointingly.